Wow, I just realized I really stink at self-promotion sometimes. I filed a piece for National Public Radio on the Philadelphia mayor’s race the other day. And while I mentioned this story on the blog while I was working on it, it completely slipped my mind that I’d meant to post an update when the story actually ran. So here’s a link to the NPR story, and a few thoughts. On the one hand, this year’s mayoral election is dreadfully boring compared to the general election 4 years ago. Although there was no primary to speak of (while there are always a few unknowns who throw their hat in the ring, there was only one well known Republican and one well known Democrat seeking party support), a federal corruption investigation became public during the final month of the campaign. The FBI had planted a bug in the mayor’s office, although we later learned they weren’t trying to listen in on the mayor so much as some of the folks who visited him periodically. In a strnage turn of events, the mayor rode this investigation to victory by suggesting it was a ploy by the Republican White House to topple a black Democratic mayor in a major city. This time, the general election is essentially the primary. Five Democrats are running for an open seat in a town where Democrats outnumber Republicans by about 4 to 1. The sole Republican candidate is a businessman named Al Taubenberger. He’s head of the Northeast Chamber of Commerce, a nice guy and generally well respected. But he’s run unsuccessfully for several other offices, and he’s got about $200 in the bank right now. Conventional wisdom is he doesn’t stand a chance in the fall. As for the Democrats, four are career politicians, and one is a millionaire who spent 18 months as deputy mayor in the 1990s. Tom Knox is running as the outsider who’s going to clean house and “take the for sale sign off City Hall.” For most of the year, he was way ahead in the polls because he was able to start spending money long before any of the other candidates. He’s put about $8 million of his own cash into the race, which is twice what any other candidate has. But now that everybody’s advertising, former City Councilman Michael Nutter’s been moving into the lead. He’s championed business tax cuts and he wrote the city’s new smoking ban law. Nutter appeals to much of the same pro-business community that Knox does, but he’s got a slightly less wooden personality and a longer track record. Still, with a 5-way race, the winner only needs 21% of the vote. And with a lot of undecided voters out there, anybody could still win on Tuesday. It’s kind of funny because for most of this year, there wasn’t much negative campaigning. The candidates ran by-the-book issues based campaigns. And the public didn’t really seem to notice very much. As one political analyst I spoke with said, this has been the kind of campaign people always say they want, and there’s a huge number of undecided voters out there. Go figure. Anyway, I had to whittle my story into three minutes and forty-five seconds for NPR, so there was a lot I didn’t get a chance to say. 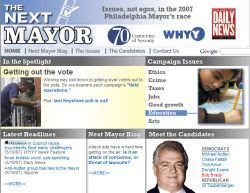 For example, one of the reasons Philadelphians might be having a hard time making up their minds is that on many issues, the candidates sound a lot alike. Sure, Congressman Chaka Fattah wants to privatize the airport, and former Councilman Michael Nutter wants to train police to “stop and frisk” suspects that look like they might be carrying guns. But they all want more control over the city schools, they all want to reduce taxes, and they all want to fight the city’s high homicide rate by hiring more police officers. I’d put together this brief montage of campaign ads for an earlier draft of the story, but we didn’t have time to cram it in. Anyway, it’s kind of nice working on the mayor’s race as sort of my last hurrah before moving to New York. I spent a lot of time and energy covering politics during the Street administration. I’m glad that in some ways I get to see how the story will end before I leave the area. I’ll be working with WHYY on Tuesday to help provide live election night coverage. Should be fun, and mildly exhausting.